The holiday season is just around the corner and it one of the busiest seasons for airlines; like millions of other people you probably are considering traveling to see your family and friends. And if you are anything like me you want to carry on to avoid checking in bags, if at all possible, especially now that airlines charge you for checked baggage. As I stated in my post on 15 Tips for Flying with a Lap Infant, I am not an expert flying with a toddler, but have done it many times in the past 20 months since C2 was born. To provide additional value, I have partnered with another mom, Kristy Wood stay at home mom to 20 mos. old J. Kristy travels often with J and has been on 14 flights with him. We are two moms that want to share our tips and experiences with other parents in hopes that our tips will make your travel experience a bit more pleasant and less stressful. Here are our top 10 tips on how to Travel Carry on Only with a Toddler. 1. Research. Research. Research. Purchase. Prior to purchasing any items for travel, research and think about the items you really need versus the items you want. My husband and I travel a lot, so when we found out we were expecting we knew we had our work cut out for us. I hate to check baggage with a passion, so this also fueled my need to pack smart, and buy products that served more than one purpose, or were compact. Every trip that we went on after we found out we were expecting became a research trip. We would look around the airports, planes, and at families traveling with small children to see what was working and what wasn’t. Don’t be afraid to ask. 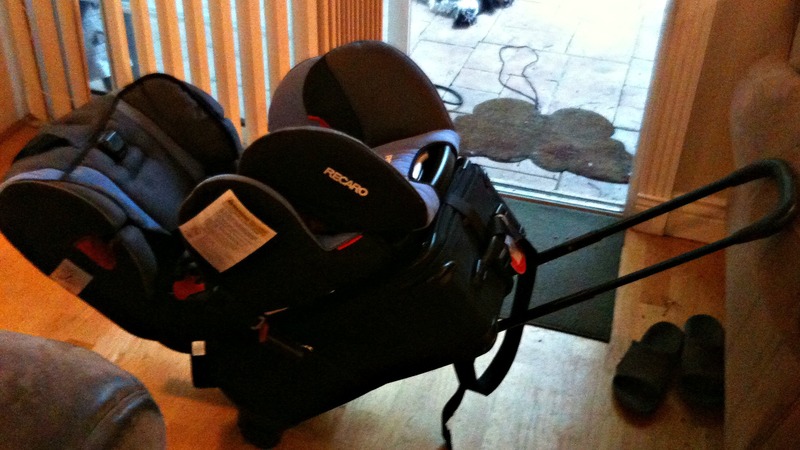 I discovered the Graco Snug and Ride when I talked to a new mom while preparing to board a flight that I saw the typical “travel” systems that were being offered as a car seat combo were actually bulky, and not really a good travel system. She had returned hers, and was using a frame combo, which I immediately registered for as soon as I got home. We had always planned on my son having his own seat when we traveled, so we wanted to get one car seat that was good for daily use, as well as travel. 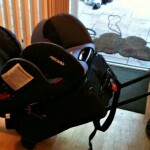 The Graco fit this need, plus it was comfortable for me to carry with, or without an infant. *Update* Now that my son is too tall for the Graco and we have switched to using his Recaro car seat. I was very hesitant at first, and figured that we would need to buy a smaller travel friendly one to fly with. Then I saw the Traveling Toddler. I highly recommend the Traveling Toddler travel system; it is great. I was able to attach it to my carry on suitcase with a strap, and wheel it around the airport. The best part was that my son actually slept in his seat when we got off the plane, was re-hooked up to the suitcase, and slept until we made it to the curb and our awaiting ride home. The Recaro is a heavier car seat and I was really worried about this when my husband came home with it. It is a great system that I will use as long as we use the car seat. However, in order for the Traveling Toddler to work well, I would recommend having a sturdy carry-on. 2. Pack only what you need. We are big fans of having Amazon.com or Diapers.com deliver various supplies to our destination, especially if we are staying longer than 3 days at any one place. By sending your supplies to your destination, you will be able to reduce your luggage size because you are not packing a week’s worth of diapers, wipes, snacks, etc. We have had supplies shipped all over the U.S. and have never had an issue. Amazon Prime or Diapers.com has next day shipping and the majority of the time shipping is FREE. If you are an Amazon Prime member, shipping will be free if the product is directly sold through Amazon not one of their third party vendors. The prices are very competitive on both sites not to mention also it sets eases my mind that I do not have to worry about packing one more thing. Not sure what our parents did before Internet shopping. Another consideration is to mail a priority box(es) to yourself at your arriving destination. It is most likely cheaper and less hassle than checking your baggage. Kristy does this before she leaves for trips. She feels more organized because when she arrives at her destination, she has everything she needs. 3. Ziploc bags are not just for food. I cannot tell you how much I can pack using these things. I pack all electronics and power cords in one bag. I pack snacks both for the big kid (my husband) and my toddler in one. Depending on the length of a trip, I usually can pack my sons and my clothes in one carry on suitcase. Then the second carry on is for her husband’s clothing, miscellaneous shoes, toys, sleep pod/tent (Kidco PeaPod Plus Indoor/Outdoor Travel Bed, Red), etc. 4. Duffel bags and/or back packs are a must. They are easier to hang on the stroller, fit under the seat in front more easily, and you can rummage around in them while they are on the floor between your feet. Before my son started carrying his own little backpack, everything my toddler and I needed for the travel day (e.g., snacks, diapers, wipes, sunscreen, change of clothes, books, etc.) was packed in a large Columbia messenger diaper bag. Now, I started using a large tote bag, whereby, I store the diaper bag, purse, electronics bag, etc. in it and uses that as her carry on one bag. My favorite bag is the Lands End Totes and I consider them a must have! For Lara, her backpack is like my Lands End bag; it is her new best friend. The bag might change depending on destination or occasion, but is pretty much consistent. My husband thinks I pack like I am in the military, but there is a method to my madness and it usually works in the end. Funny enough, my father in law was an USAF Col, but my husband is complete opposite of his father, you would think he did not grow up as a military brat. 5. Safety of your baby’s or toddler’s favorite toy(s). You do not want a melt down on the plane or at the hotel because you lost their favorite toy. Buy toy straps, or use ribbon to tie baby’s favorite toys to the car seat. This comes in handy; you aren’t worried about dropping toys while going through an airport, or falling under seats while flying. 6. Gate-check the car seat. If your child is traveling as a lap infant and you are planning on driving anywhere at your arrival destination, you will need a car seat for your baby/toddler. If your child is in an infant seat or you’re bringing your convertible car seat, gate-check your car seat is a must. According to Sharon, mom to 3 and a flight attendant, so many car seats are lost and broken by the airlines. Anything that gets counter-checked will be handled the same way as your suitcases are, literally thrown in some cases. Such rough handling could damage a car seat, and even if the damage it not visible, it could cause the car seat to break apart in an unintended way in a crash. Compensation is rarely given and this faces the parent of a lap baby with a dilemma if they were counting on that seat to transport the baby on the ground, after arrival. A lap baby in the air is one statistical risk but driving on a highway with your baby in your lap is another whole matter! By gate-checking the car seat, you reduce the amount of handling by airline workers because you deliver it to the gate yourself. The chances of it being delayed are greatly reduced because you hand it over right before the flight and collect it immediately after. Also, you can use a car seat in an extra seat IF there are free seats. You will need to ask about this at check-in. Please note, it is not a right and most airlines will not re-seat other passengers to accommodate this but if the flight is not full, it’s a good idea. 7. Ensure the car seat is FAA approved. If you are flying a U.S. registered company and your child has his or her own seat and you brought their FAA certified car seat, it is your right to use it on board which is protected by law. The FAA recently clarified its position and now any child up to age 18 can sit in an approved car seat. This is welcome news, especially for the parents of children with special needs, who may need the restraint while flying. Here is a FAA document to back up this information. It may be a good idea to look it up, print it and even bring it along. This is “FAA Advisory Circular 120-87B” which some parents print up and take along. Look specifically at page 11 (at the bottom). Please note that if a car seat is FAA approved, it does not automatically mean that the seat will fit on all aircraft seats. If you are worried that it will or will not fit, measure the bottom or at the widest point of the car seat and then call the airline to verify if it will fit. Have your exact flight number and they can look up the width of the airplane seat. A few airlines have this information on their websites. If your toddler is no longer in an infant carrier, you can rent a toddler/convertible car seat with your rental car. Note this is ONLY for toddlers in convertible car seats. According to Sharon, mom of 3 and flight attendant, car seats provided by rental companies are at best dirty, worn and incorrectly washed (i.e. soaked straps). At worst, they could be expired, missing parts and could have been involved in a recall. Your children’s safety is too important to take the risk of using one of these. I have used the car seats at car rentals and they have been relatively new car seats and I never had a problem, but now I am reconsidering bringing our own for our next trip. 8. Bring a stroller and a baby carrier. Get a baby carrier that allows you to wear the toddler, preschooler, or Kindergartener on your back. My favorite for a toddler is the Deuter Kid Comfort II Child Carrier, and for an infant the Baby Bjorn or the Ergo Baby Carrier. That way you can fill the stroller with luggage and the car seat. Or so you can get your sleeping 2-4 year-old through the airport comfortably. As I mentioned 15 Tips for Flying with a Lap Infant, strollers are invaluable especially when carry babies, bags and drinks. At some large airports like Chicago’s O’Hare airport the walk can take up to 20 minutes to get to security to your gate. Most airlines allow you to gate check your stroller, even the bulkier strollers like a BOB jog stroller. Be sure to check the airlines regulations on strollers and car seats prior to going to the airport. You can find the link to most of the airline regulations here. 9. Flying alone ask for a gate pass. I received this tip from Sharon mom of 3 and flight attendant, if one adult is flying alone with more than one small child; ask at check-in for a gate-pass for the person who drives you to the airport. Gate-passes are given out by the airlines, and they are not supposed to be for people flying with children. But you can ask. At worst they will say no and be rude about it. A gate-pass allows a support person through security and to the gate without a boarding pass. They are intended for one adult to accompany minors traveling alone to the gate, one support person for a passenger with a disability, or for the families of U.S. military leaving for or returning from active duty. 10. Keep yourself calm. With the corollary of “Keep everyone rested and fed as best possible.” Everyone is more likely to be more stressed when hungry or tired. That includes your husband’s too. We hope your travels with your toddler are a success and you’re able to just pack carry on bags. Look for more of our Traveling with a Baby & Toddler series. Kristy Wood is a work from home full time, new mom to a 20 mos. old toddler J. She likes to do crafts, and bake. She and her husband love to spend time outdoors and most of all travel with J. Follow Kristy on Twitter @KWood916.